Apex Adds Specialized Roofing Equipment - The Equipter! The Equipter Roofers Buggy - No Mess Roofing! 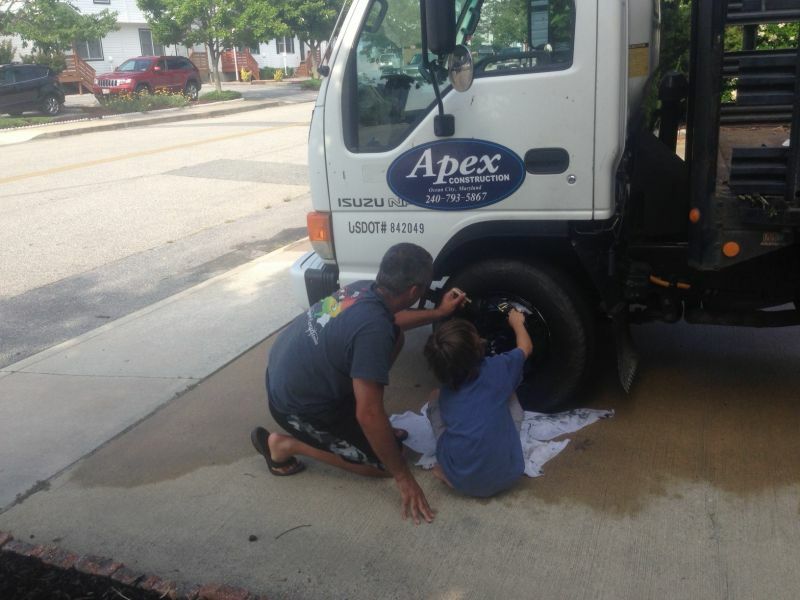 Apex Construction continues to specialize and separate ourselves from the competition by adding specialized pieces of equipment that will improve efficiency and customer satisfaction. 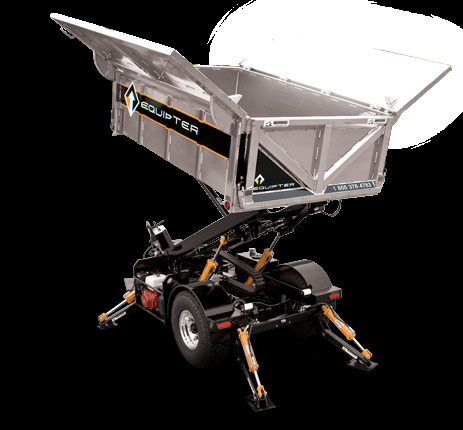 The Equipter Roofing Buggy is designed to remove tons of roofing debris safely without destroying your flowerbeds, shrubbery and landscaping. We can easily maneuver the Equipter RB4000 and raise the unit to roof level to catch all the debris at the source. This protects your landscaping and saves us the messy cleanup on the ground. Customers also don’t have to worry about where shingles and roofing nails fall on the ground because it’s all caught at roof level. If you can tow 7500 pounds with your truck, just hook up the Equipter like any trailer and haul it to your site. The RB4000’s drive axle automatically disengages when hooked up for towing. Once at the site, the RB4000 is a self-propelled trailer, and can move around under its own power with its gasoline powered hydraulic drive system. At just 6’ wide, the RB4000 can get into small spaces where truck and trailers just cannot go. The Equipter has a very tight turning radius and the large tires provide excellent traction, but distribute the weight to reduce ruts and marks on your customers’ lawns. Landscaping can take a beating during a tear off procedure. So, we designed the RB4000 with a rear extension roll back feature that extends its large container over obstacles like shrubs and flowerbeds. It also places the container well within reach of your crew for either debris removal or new material transport. Get the debris out easily and safely, with the container so close by. The wide doors extend the catch area to 10.5’, ensuring all the debris goes into the Equipter, not onto the ornamentals down below. Once you take the old stuff out, bring the new in, using the RB4000 as a lift for tons of new materials, right where your crew needs them. Up high, down low, it doesn’t matter. Just extend the hydraulic tail gate and you’re ready to dump the load anywhere you need to. And, since the RB4000 is a self-propelled trailer, keep that big truck off the lawn and let the Equipter deliver the debris there safely and easily. 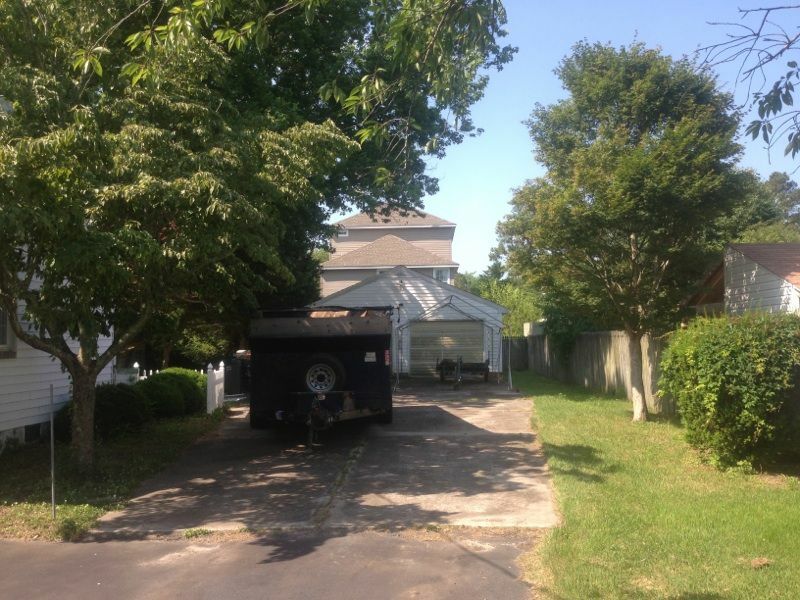 Get a New Roof with No Mess - The Equipter! 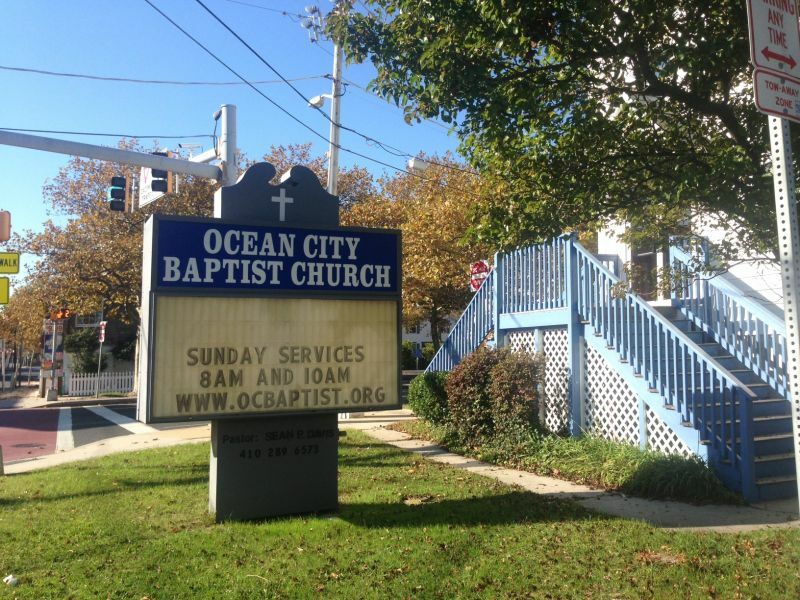 Protecting Your Landscape - New Roof No Mess! It seems pointless to invest in a new roof only to turn around and replace landscaping that has been pummeled by piles of falling debris from your homes roof top. This is exactly how it tends to be with conventional roofing methods. The roofer is left to clean two messes: First the roof and then the lawn. This adds time to the job, as well as unwanted alterations to your landscape. 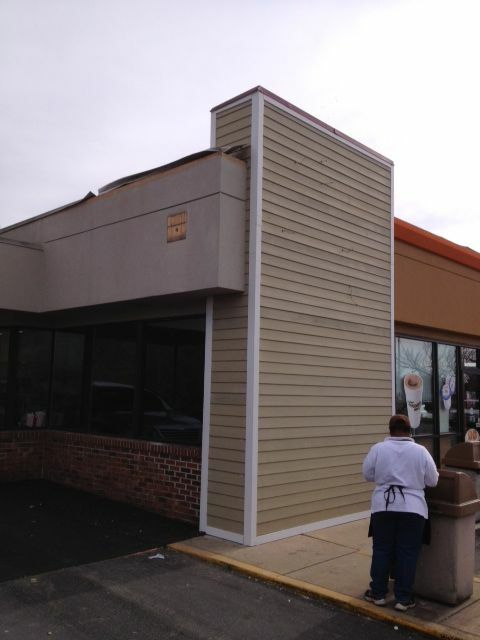 Until recently, there was no alternative to a messy roofing job. 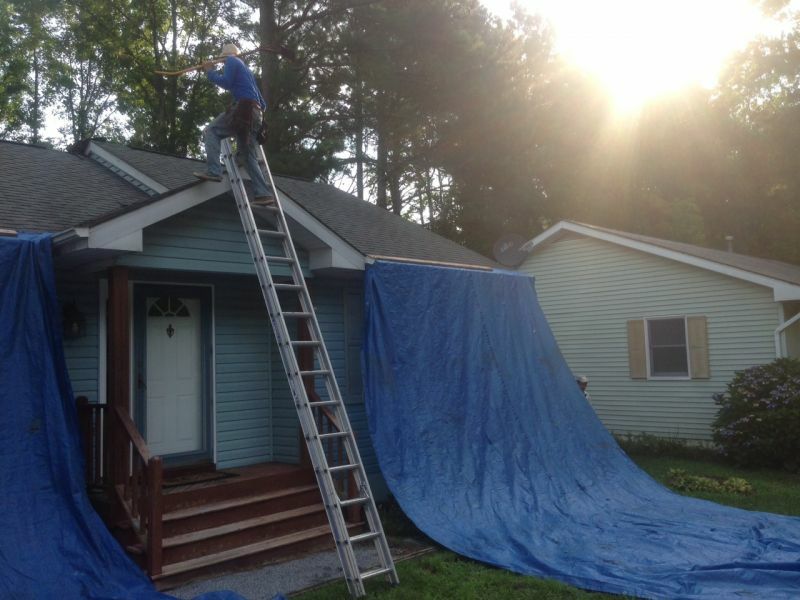 When getting a new roof, it takes more than a blue tarp and a trash container to protect your landscaping from imminent destruction. 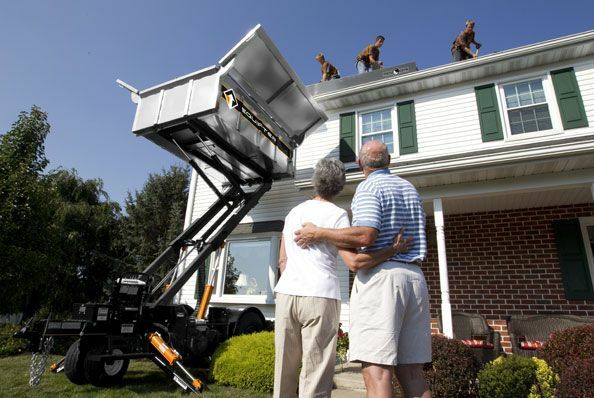 The New Roof No Mess program incorporates an innovative piece of machinery called the “Equipter Roofers Buggy.” With the Equipter Roofers Buggy, Apex Construction is able to contain roof debris at the source to easily remove it without doing damage to your home’s landscaping. In the past, the question has been, “How can roofing debris be disposed of without causing damage to the house and landscaping?”. It was this question that led to the development of the Equipter RB4000 Roofers Buggy. The Equipter Roofers Buggy is designed to remove tons of roofing debris safely without destroying your flowerbeds, shrubbery and landscaping. 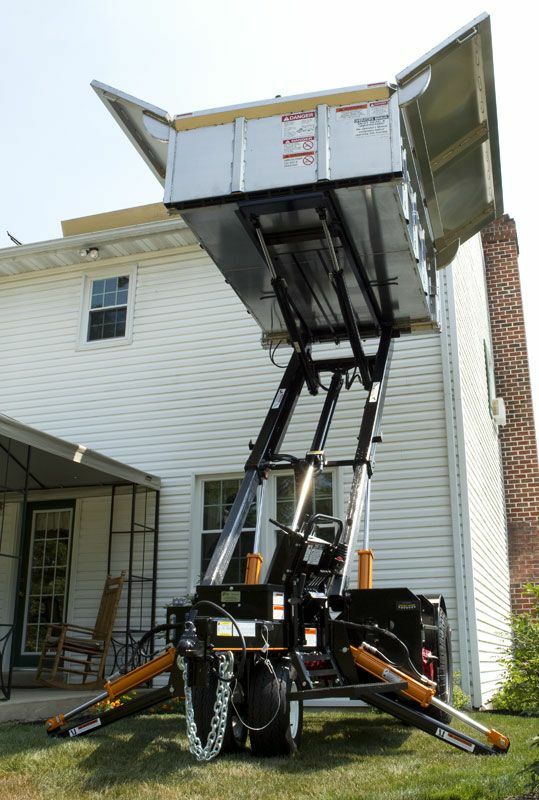 SHIRK BROTHERS ROOFING can easily maneuver the Equipter RB4000 and raise the unit to roof level to catch all the debris at the source. This saves your landscaping and saves the roofer the messy cleanup on the ground. You also don’t have to worry about where shingles and roofing nails fall on the ground because it’s caught at roof level. 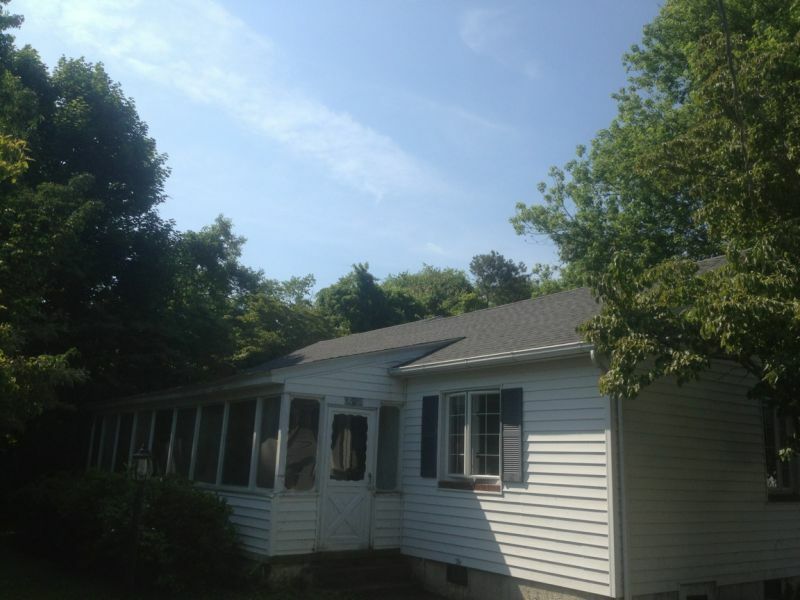 Get a New Roof with No Mess – Guaranteed! That heart of the New Roof No Mess system is to give home owners a service that protects their property and family, with a roof that will keep them dry for years to come. 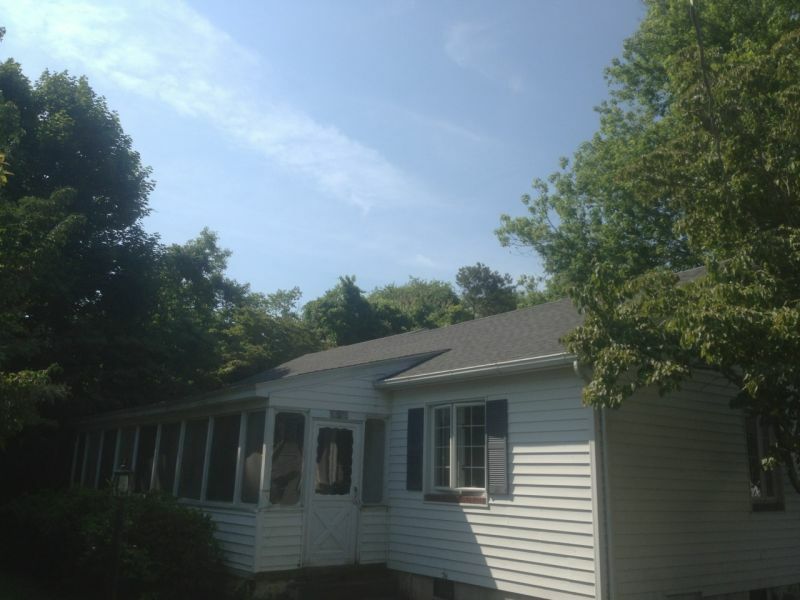 When all is said and done, the outcome is a new roof that has been neatly and efficiently accomplished without any unnecessary damage to your home’s landscape, belongings or structure. 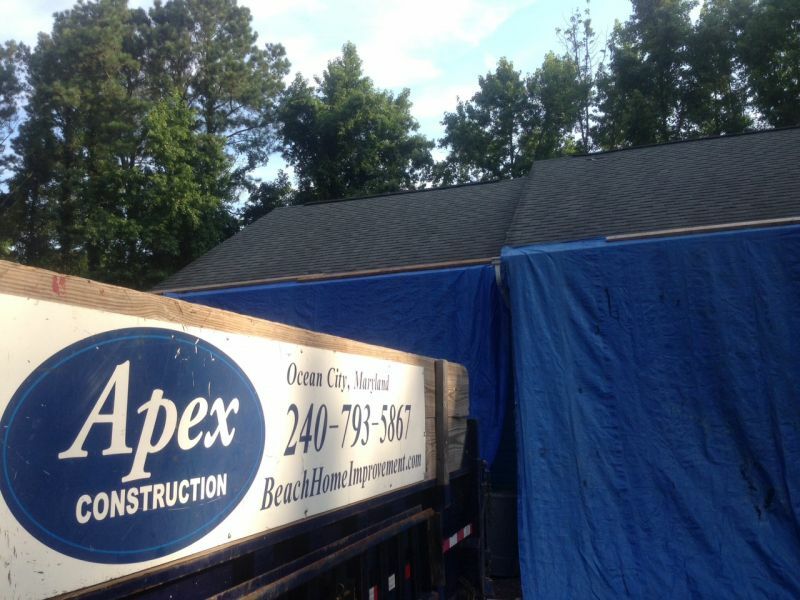 Apex Construction’s ‘New Roof No Mess’ philosophy is the safest and most efficient way to re-roof. 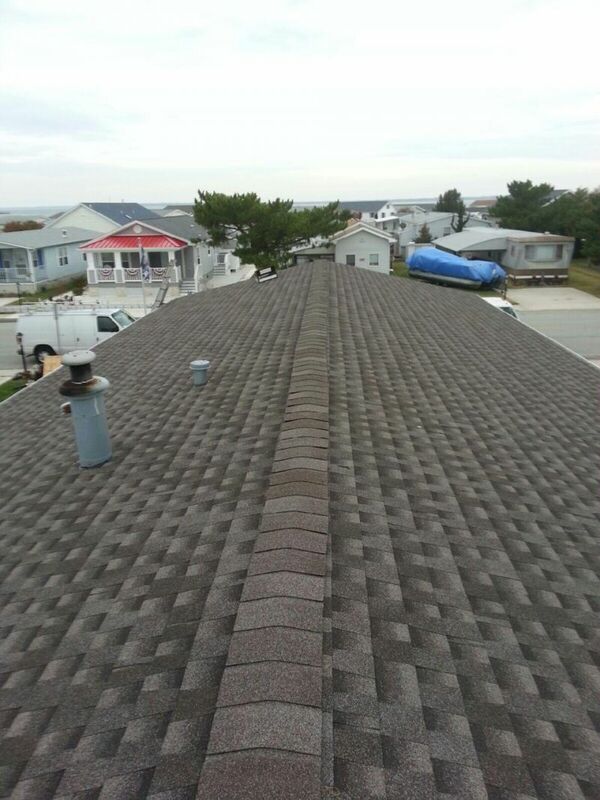 Without the danger of falling debris, you can rest assured less accidents will happen when getting your roof redone. 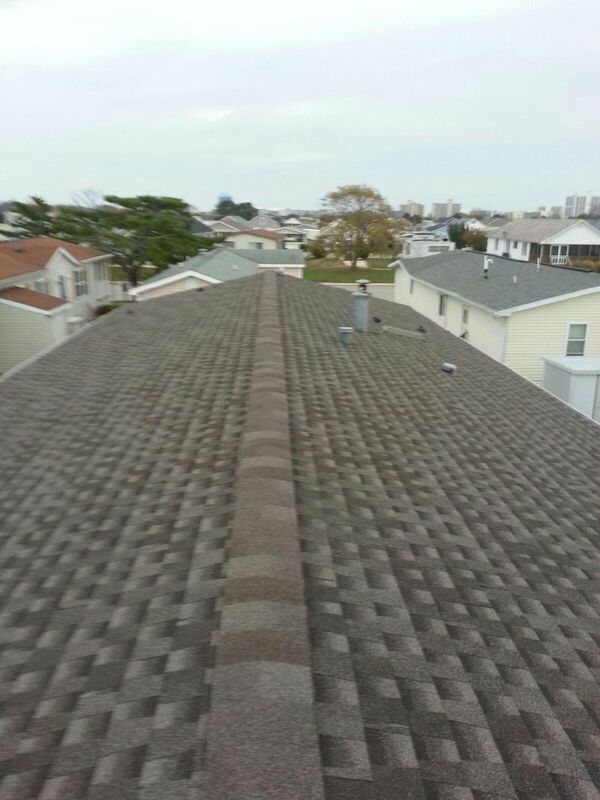 Hiring a roofer that can offer a New Roof with No Mess is a wise choice and assures homeowners that their money will not be wasted on unnecessary clean-up costs. Contact Apex Construction today and learn more about the advantages of using a contractor that utilizes the Equipter RB4000 Roofers Buggy. Asphalt roof shingles have three main components: the base (also called a felt, mat, or substrate), an asphalt coating, and a weather-resistant topcoat made from mineral granules. 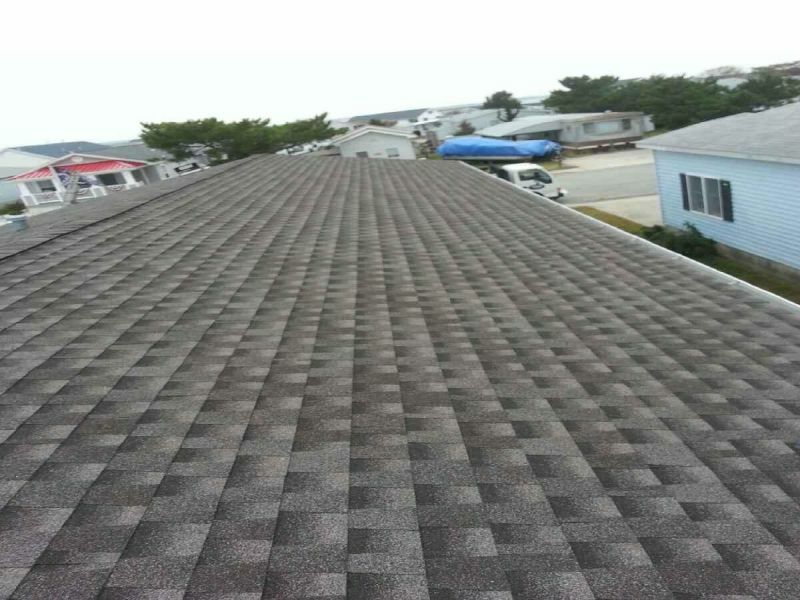 The shingle base provides it with structure and strength, the asphalt lends a degree of weatherability and stability, and the surface granules give a shingle its color in addition to ultraviolet ray protection. 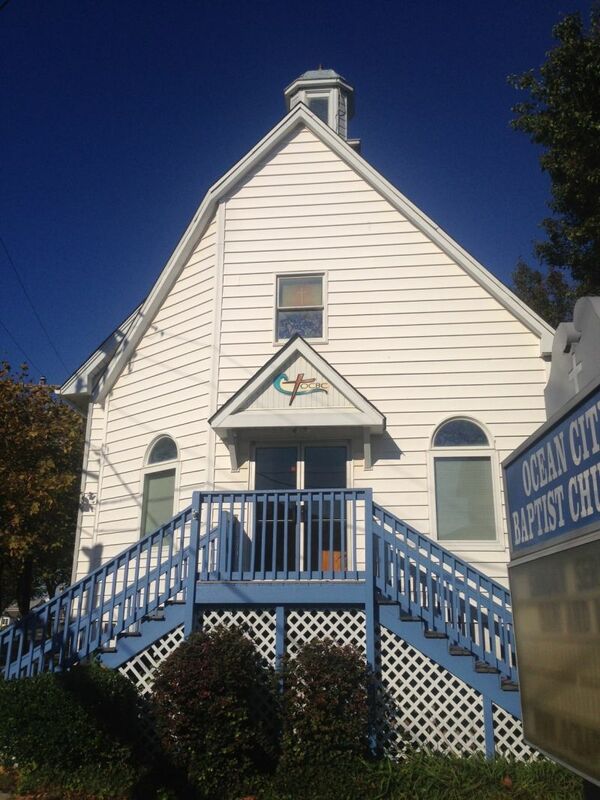 Contact Apex Construction for more information or for a project quote on your next roofing project.